WILD STYLE a story of 1980s New York graffiti through the lens of hip hop culture: an interview with Charlie Ahearn in WALL TO WALL: graffiti art, vol 34 no 1, 2014, of Artlink. Wall to Wall was co-guest edited by Annemarie Kohn and Charity Bramwell. 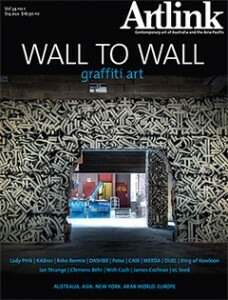 The issue offers readers a chance to compare their attitudes to graffiti art with those of a range of authorities from rappers and writers to scholars and critics. The issue covers the birth of this art movement and subcultural genre in New York four decades ago and its current role within the constantly shifting politics of public space in cities across the planet including Asia and the Arab world where the richness of calligraphy-based graffiti art and its influences on the art form in other countries adds a new dimension. Interviews and stories of many of the key artists from the past as well as documentation from cities around Australia add a personal note.